Experience of the past, insight of the here and now. In 1880 Piet van der Wegen and his brother-in-law set up the engineering works Machinefabriek P. van der Wegen BV: a service work shop for the textile industry which at the time was a well-represented trade in the Tilburg area. In 1905 son Willem entered the business. Together with his brothers Frans and Harry he took over the business in 1913 and started producing textile machines. It was Harry van der Wegen in particular who in 1931 took the initiative to expand the business by producing gears and gear boxes up to a diameter of 4.000 mm.. After the crisis years in the regional textile industry during the fifties of the last century the company switched to producing only gears and gearboxes. Important clients from that period included DSM (Dutch Minimg Industry), Rijkswaterstaat (Public Works and Water Management) and Hoogovens (Dutch Steel Industry, now Corus). The third generation joined the business in 1955 under the leadership of Harry’s eldest son Piet, in partnership with Frans’ younger son, Albert. The complete takeover of the company was realized by 1976. In particular Piet van der Wegen felt strongly about exporting products. He dedicated himself to the production of the big gears and in 1965 purchased a Lorenz gearhobbing machine. 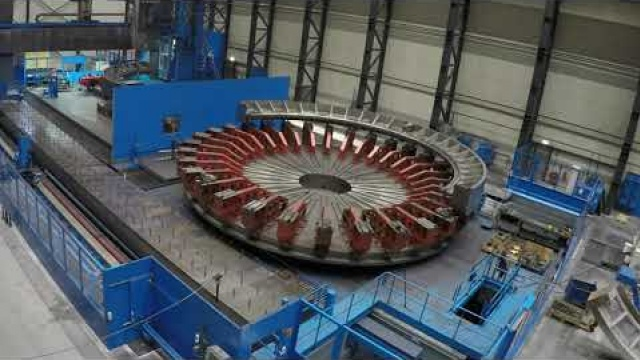 This machine was able to produce gears up to a diameter of 6.500 mm, which turned out to be a golden investment. The company grew steadily thanks to the explosively increasing export. Meanwhile Machinefabriek P. van der Wegen BV became known as a highly respected producer of gears, gear boxes and other gearing elements. In 1988 the fourth generation presented themselves. Pieter en Dirk van der Wegen, Piet’s sons, eventually assumed total control of the company in 1994. Piet continued to guide his sons for two years,and then gradually started to enjoy his retirement. Since 1994 P. van der Wegen Gears BV has developed into a worldwide export company. All buildings and machines were replaced and thus one of the world’s most modern producers of gears arose. P. van der Wegen Gears BV currently produces gears up to a diameter of 16.500 mm, weighing a maximum 250 tonnes in piece weight, and with it’s ultra-modern machinery is in a position to perform various heavy mechanical processes. Not just the very large, but also small gears and gear-boxes are produced. This takes place using the very latest CNC techniques and machines to guarantee the best quality and turnaround times. The combined knowledge that has been built up over the years, together with the recent developments in P. van der Wegen Gears BV’s machinery have formed a solid basis for a healthy future.